With the numerous activities, time management in the workplace can be the best way for professionals to allot the right time for significant activities. The right usage of time for the right task at the right time is effective time management skill. Time is valuable and cannot be gained back once lost. Professionals who waste time at workplace would struggle to complete tasks at time. As a result they would be criticized by superiors and are unable to complete their tasks. For the same reason tips for time management at work for professionals are important and here are a few tips for your knowledge. 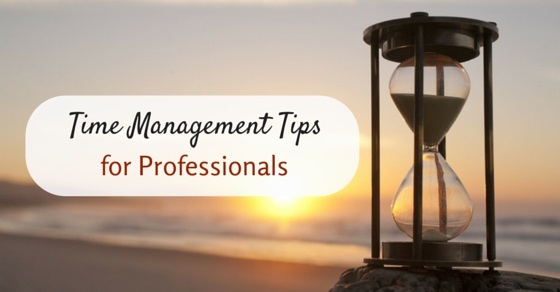 The following mentioned are few effective time management tips for professionals who are extremely busy at work and want to understand the importance of time management. The basic and initial requirement to follow time management technique is to reach office by time. It would be advisable to avert long leaves and be to work at time. In the same manner roaming around during the office hours is also a waste of time which can be used productively by working sincerely during working hours. Being punctual is important aspect in time management at work for professionals. Once the employee reaches office, the very first thing he requires to do is to prepare a task plan for the day. Mark time slots for all the important tasks that need to be finished earlier. Important and immediate assignments should be the ones that should be completed first and low priority ones can be listed later. Keep it a habit to strike or tick off the completed tasks from the list. It is mandatory to keep you workplace neat and tidy. Make it a habit to keep files and documents in the right place in the right order. Avert writing important notes and points on loose pieces of paper as they may get lost. Allot a separate place where you can place all your personal belongings so that they can be picked when required. Keep your login in a neat manner, never clutter and make a mess with your desktop. Arrange all your files and folders in a neat and right manner with appropriate folders for all files and save them accordingly. Emails are another aspect when system is considered, managing them well is required. Work place is to work and utilize the ample time for work. Attending and speaking personal calls for hours can be avoided during office hours. Completing work at the right time is mandatory whereas family and friends can be allotted separate time after office hours. One should know the time management methods to balance personal as well as professional life. An individual should work with dedication and motivation from within, instead for salary or boss. It would be advisable not to hangover by office gossiping and playing computer games. This is a mere waste of time, which can be used to be productive. The employee should be clear about objectives as well as goals that are to be accomplished. If there is doubt about any such ideas, the employee can immediately approach his boss for clarifications. It is also suggested to plan well before, whereas planning is the only aspect which assists to complete tasks at time. When you’re assigned with work, make sure to accept work which you’re able to accomplish. Do not accept tasks which you think would be tough to handle. When you’re allotted with such tasks remember to say a firm no, as it may save more of your time. The most efficient way and a golden rule for managing time is to work on the most important chores first. Run through your planner and pick out the important tasks which are considered very vital to be accomplished and complete them first. when such projects are completed, your day is made successful. When mandatory ones are completed you will have ample time and you can work on other projects or wait for other chores. In the process of managing time and completing assignments well in advance, there are many people who do not sleep well. Professionals possess the mentality that sacrificing sleep and working for more hours can reap productivity. But that’s a wrong idea, a minimum of seven to eight hours of sleep is mandatory for human beings so that mind and body function in a proper way. Having a good sleep and working fresh the next day will definitely make your work successful. Concentration and devotion towards work is another aspect which manages time. It would be a good idea to make your work environment silent and without distractions. Close all your browsers and keep away your mobile in silent mode so that you avert unnecessary calls and messages. Learn to focus on work and concentrate on one task in hand so that you complete it before time with excellent quality. It would always be considered as a good habit when you start any of your assignment early rather than procrastinating. It can be followed and makes your work less stressful and can manage things early. It is the attitude of the individual to have the enthusiasm and interest to start work early. You must have proved yourself at work as a perfectionist and sometimes it happens that some projects may have small details which may seem imperfect and could drag you down. It would be perfect to push away the completed project rather than revising for minute details. You can plan in another way, where you can complete the bulk and finally get your bulk revised. This will help you manage and save time. The main way through which productivity is drained is by entertainment such as internet, gaming and TV. It would always be good if one is aware of the time utilized for all these activities. When noticed, they will get to know the time being sucked up and can reduce them from next time. When projects are allotted to professionals they should be alert and fix time for completing the project rather than sitting on work for the whole time. When time is fixed for each project, work is accomplished quickly and efficiently too. Professionals are cluttered and manage multiple projects. When they complete one task and are about to begin the other, it would be good to take a break by walking, breathing in fresh air, listening to their favorite music or by meditating. All these aspects would make them fresh and help them start their work in a new manner. All these mind clearing techniques will enhance productivity and make them well-organized. It is the truth to do less which really matters, instead of trying to achieve a number of tasks at the same time and offering an empty output. Doing less but producing quality output is a good idea. Do not rush will all chores together, instead do one at a time so that you complete it in a faultless manner. Life is always filled with chores, and it is the duty of the individual to master the crucial and mandatory ones and leave behind the unnecessary ones. To manage time in an efficient manner, eliminate the tasks that are unnecessary. When a group of people are assigned a task, it would be better for all to discuss and work consecutively. This way all ideas are shared and a new innovative output can be expected before deadline. However, working with group can also be considered as a great time saving technique. It would help other professionals when someone shares tips and ideas about how to manage a project or time. By this way they are educated and try to follow time management strategies and handling projects. These few tips for time management can be of great usage to professionals if followed. Time is valuable and managing time in life is important. Apart from managing time and rushing with work, enjoying the work one does is also important. Being focused on work and getting it done can be regular, in the same manner enjoyment in life is also needed for a certain time span. The main objective should be to arrange your assignments and make a balance with work and life. By following this, work as well as life can be enjoyed and made excellent. Quite surprised that tracking time is not on this list. Time tracking is essential to manage your time and see where you are spending more money and resources. I’ve started using Timeneye (https://www.timeneye.com) and my productivity boosted. I should have definitely started before..